Almost everyone agrees that daily Bible reading is an essential part of our walk with God. Yet many of us would probably admit that we don't read the Bible as often as we would like. For some, the Bible can feel boring and irrelevant to today's fast-paced culture. For others, the strange names, foreign places, and puzzling stories can leave us feeling frustrated. And because reading it can feel like a chore, we find ourselves only cracking our Bible open on Sunday morning. 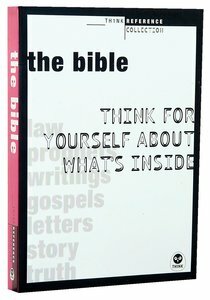 TH1NK Books presents The Bible: Think for Yourself About What's Inside, an easy-to-understand resource that illuminates the relevance of the most-studied book in human history. With a conversational approach and refreshing perspective, this resource provides an accessible study of many of the nuances of Scripture. Inside you'll find answers to tough questions, essential biblical highlights, and individual reading plans that allow you to grow at your own pace. Whether you're new to the Scriptures or have studied them for years, The Bible: Think for Yourself About What's Inside is an invaluable resource for understanding and taking delight in God's Word. About "The Bible (Think Reference Collection Series)"
Rick Bundschuh gives us a clear reminder that we aren't here to do church, we're here to be the church. Learn to live out your faith while reexamining what the church should be about.